Over a century ago, discussions between the Diocese and the Franciscan Friars led to an invitation to form a new parish in this community. 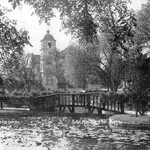 On December 31, 1894, Fr. Augustine McClory OFM became our first pastor. 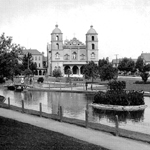 He secured pledges from his new parishioners, purchased land for $7,000, and in January 1895, in temporary facilities, conducted the first church services. 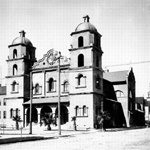 The church building was completed in two months, at a cost of $14,000; it was formally dedicated on April 7, 1895. 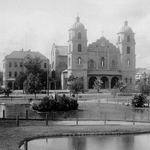 The parish quickly grew, and the cornerstone for a larger church was laid on the site of the first church on October 18, 1908. 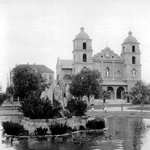 Two years later, on October 23, 1910, the new church was dedicated. More recently, in 1983, interior renovations to improve lighting and sound, and to provide ramps for the disabled, were completed. Then, in 1995, the roof was replaced, seismic improvements were made, murals were restored, and much more work was done in order to preserve this center of worship for future generations. During this century of building, re-building and renovating the Church, St. Francis of Assisi Parish also completed other major projects: the construction of a three-story school, now St. Francis Elementary School; a convent, now the site of our Parish Center, and a Friary, where Franciscan friars continue to live in community. 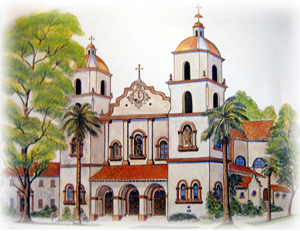 The church’s architecture is modeled after that of the Old Mission of Santa Barbara. The interior is a blend of Renaissance and Baroque styles; over 40 stained-glass windows and numerous murals decorate the ceilings and walls, portraying saints and Biblical scenes. The beautiful carved wooden staircase and railing to the second floor organ loft came from the 1906 remodeling of the State Capitol. Installed in the loft is a 1915 Austin electro-pneumatic pipe organ. The church’s bell, cast in New York in 1859, was initially placed in the tower of St. Rose Church in 1895, and later transferred to the belfry of St. Francis of Assisi Church, where it continues to toll daily. From October 2008-October 2009, St. Francis of Assisi Church celebrated the centennial of the construction of its current church building with a series of special events. Our award-winning commorative book, A Century of Grace: A People of God in a House of God, contains many photos of the statues, stained-glass windows, murals, and architectural details of the church. The book is available at the Parish Center. Call 916-443-8084 or visit the Parish Center to obtain a copy. The history was prepared for our 2008 Centennial by St. Francis parishioner and historian Gregg Campbell." Learn about our church in the first decade of the 20th Century in this latest chapter of our web site history project. Due to the many period photos, maps and other graphics that illustrate this chapter, it takes about 20 seconds to open, but it’s worth the wait! Thanks to the many people involved in this wonderful project, a list of whom may be found in the web site’s preface.